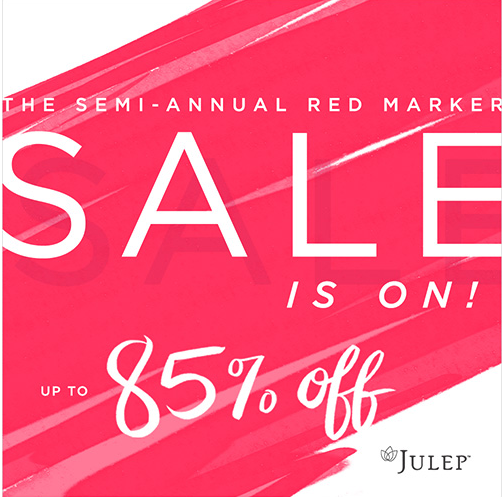 Julep has a few huge sales each year, and it's time for their summer Red Marker sale! Most polishes for the sale are $2, and there are all kinds of nail products and jewelry! There's also a mystery gift which is free with any $50 purchase, just add it to your cart and use code REDMARKER! What are you getting from the Red Marker sale? Let me know in the comments! I RSVP'd for the sale on FB but won't be able to access the FB link Julep plans to post at noon PST today (work blocks social media!). Any chance you will be posting the link? The link is already here, just click the photo or "Red Marker Sale".